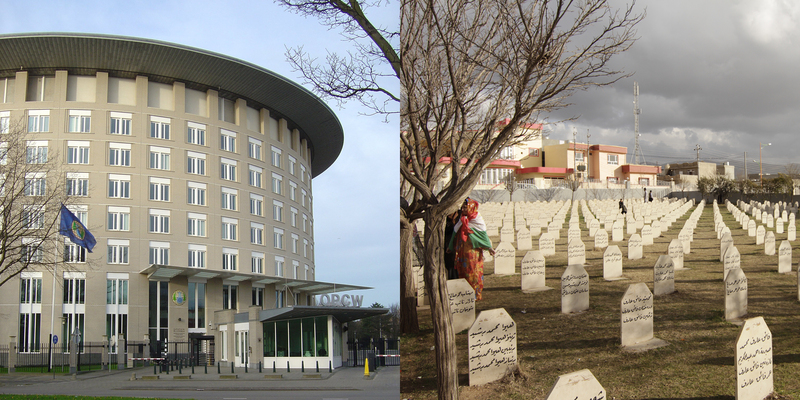 Left: OPCW Headquarters at the Hague, the Netherlands. Right: Halabja, Northern Iraq. Cemetery for Kurds killed in chemical weapons attack 1988. Chemical and Biological weapons are two other types of ‘Weapons of Mass Destruction’. Both are banned internationally. Thanks to the prohibitions, both weapon types are rarely used today. The Chemical Weapons Convention is now adhered to by over 98% of nation states. A chemical weapon is any toxic chemical that can cause death, injury, incapacitation, and sensory irritation, deployed via a delivery system, such as an artillery shell, rocket, or ballistic missile. Chemical weapons are considered weapons of mass destruction and their use in armed conflict is a violation of international law. Primary forms of chemical weapons include nerve agents, blister agents, choking agents, and blood agents. These agents are categorized based on how they affect the human body. Chemical Weapons are now outlawed under international law. Only Egypt, North Korea and South Sudan have yet to sign or ratify. This treaty covers over 98% of the globe. Access the CWC Treaty text here. Read about the Chemical Weapons Convention and the Organisation for the Prohibition of Chemical Weapons (OPCW) here. Access the Arms Control Today Factsheet on Chemical Weapons here. See further readings on Chemical Weapons on our resources page here. Read about what biological weapons are on the United Nations website here. Biological agents and toxins "of types and in quantities that have no justification for prophylactic, protective or other peaceful purposes;"
Weapons, equipment, and delivery vehicles "designed to use such agents or toxins for hostile purposes or in armed conflict." The transfer of or assistance with acquiring the agents, toxins, weapons, equipment, and delivery vehicles described above. 10 countries have not signed or ratified: Chad, Comoros, Djibouti, Eritrea, Israel, Kiribati, Micronesia, Namibia, South Sudan and Tuvalu. Access the official United Nations webpage and the Treaty text here. Access a factsheet from the Arms Control Association on Biological weapons here. Read more about Biological weapons and the BWC here. See further readings on Biological Weapons on our resources page here.